When choosing your next ultimate winter getaway, there are other things to consider besides skiing or riding and the lift lines. After all, most of your time will be spent on activities other than skiing or riding. This week, we take a deeper look into the “après” considerations when planning a ski or snowboard trip. There are many different choices to make in order to plan the perfect trip. Here are some things to consider. Ready to Mingle, Love Birds or Family Time? Ski resorts close enough to a large population base increase the amount of weekenders heading up to the hill, which will make the population swell. This means more opportunity to network and figure out where the hot-spots are. Don’t be shy or you’ll be sitting in your room all night. Today’s resorts are providing more and more amenities these days. Many times they include sports bars, clubs and entertainment. When making reservations, inquire about the nightlife to get the inside scoop. Don’t count out mountains located next to small towns. Sometimes the action in small towns is unique and more entertaining than you’d expect. Check out towns with breweries or colleges. Are there sleigh rides? Hot Springs? Snowshoeing? Casino? Shows or concerts? Snowmobiling? 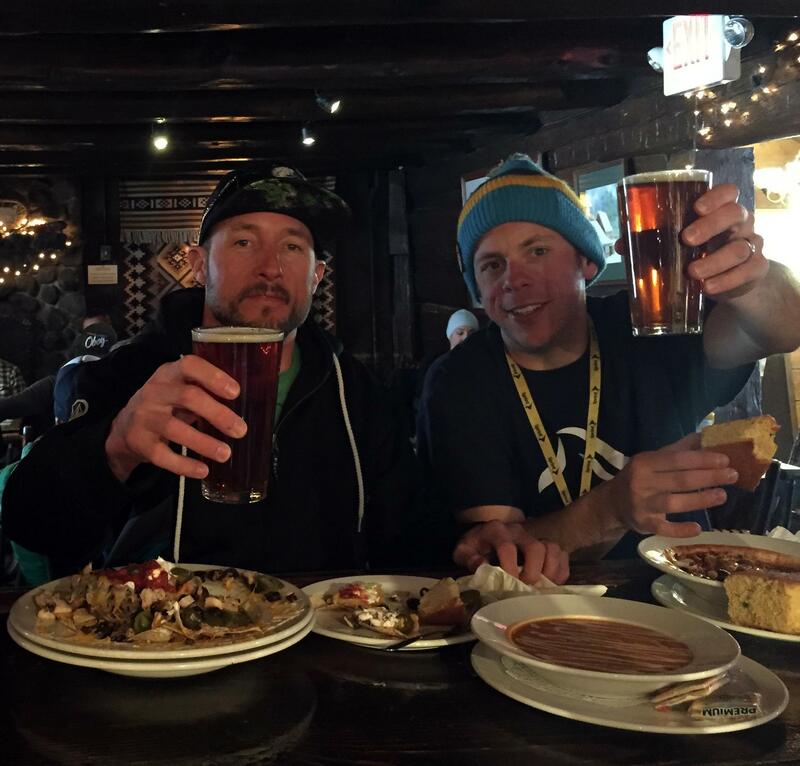 Normally, ski towns have plenty of quality options regarding cuisine. Check in advance to make sure the specific flavor you are looking for is available. Make this trip special. Take the opportunity to be creative and plan a special adventure or activity for two that will be memorable. 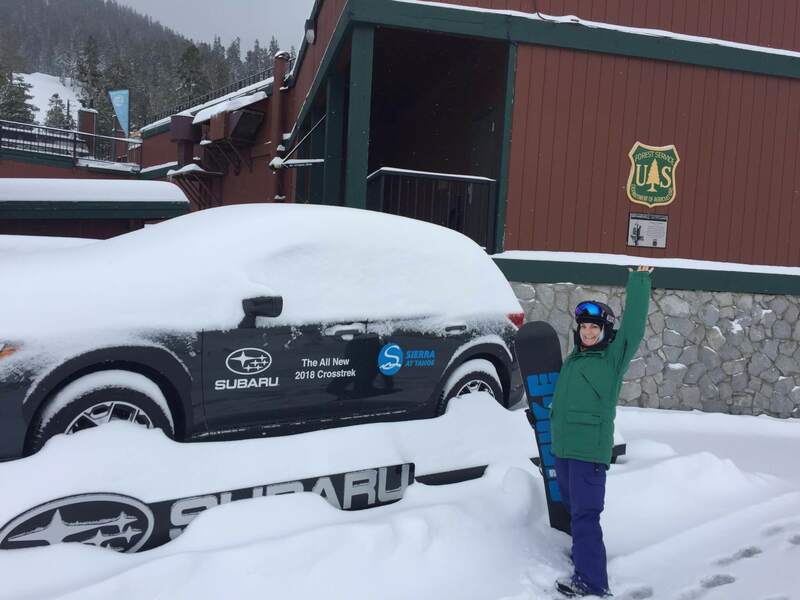 Most ski towns can accommodate your request, so the “ski” is the limit! Certain resorts have an age restriction on ski/snowboard lessons. This could be a crimp in your vacation plans. Before booking, make sure to also check into daycare. Besides the skiing, what other activities are there for kids? How close is a sledding hill? Do they have tubing? Ice skating? What Are You Looking For After A Day Of Skiing? Squaw Valley High Camp on a warm spring day. Even if it doesn’t snow, the sun will always shine so even if you didn’t get lucky with feet of powder, you can still get lucky at the craps tables across the border in Nevada. Here are two locations to consider in the Lake Tahoe basin. The original hot doggers paradise. This place has big terrain and even a bigger party scene. Heavenly likes to get the festivities started early. Right at the top of the Gondola, the Tamarack Lodge turns into a club by 2:30 in the afternoon and has DJs spinning hot music with the Heavenly Angels boogieing their way through the afternoon. After the Angels warm you up, head down the Gondola and hit up the casinos where there are multiple night clubs spinning all kinds of music. Colorado has consistent snowfall and a huge urban population in Denver so that means locals head up on the weekends to let loose and have a good time. In addition, this is a BIG spring break locale, so college kids from all over the country tend to show up and party. One town/resort to take into serious consideration is Aspen. It’s far enough away that Denverites need to stay the weekend in town. So, what’s the best part about Aspen? Ajax Mountain, which is Aspen Mountain Ski Resort, literally hugs the town. You can stumble your way from the resort to the town and wet your whistle. Tons of bars are all within walking distance of the ski resort, making for a very happening singles scene. So, what does Whistler have for the unattached male or female? 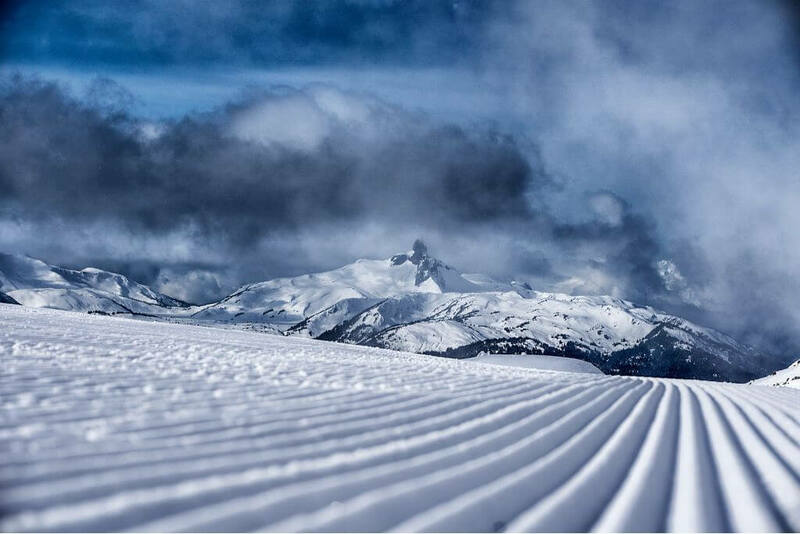 Well, Whistler is blessed with big terrain, big snow and most importantly, a village that everyone must stay at. The closest town to Whistler is nearly 30 miles down the road. In addition, the village itself is a car free zone which leads to people mingling and enjoying the bar scene that is available in the village. Whistler can get wild at night since tourists from all over the world show up to hit the slopes. 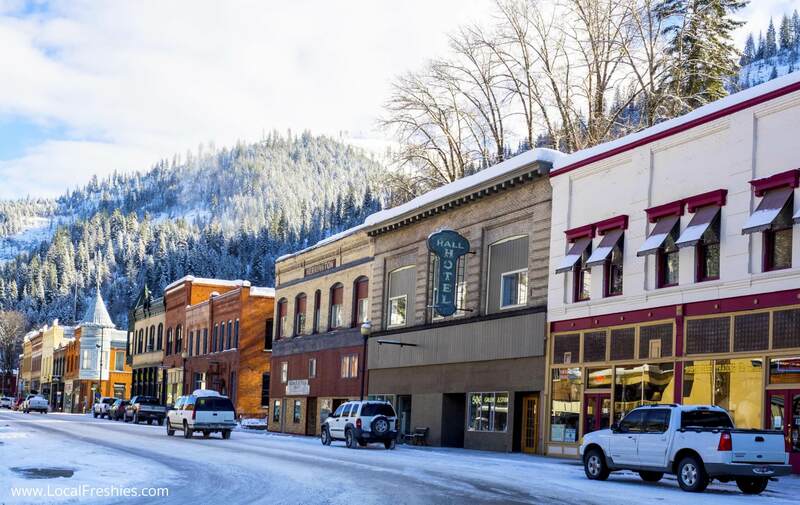 Jackson might only be a town of 10,000, but it is nearly surrounded by mountains the entire way leading to everyone being forced to stay in town. This means bars like the Million Dollar Cowboy Bar can get rowdy especially during spring break. When picking a destination, you need to take into account other activities besides skiing/snowboarding. All the resorts near Yellowstone such as Jackson Hole, Big Sky and Grand Targhee are close enough so that you could ride a snowmobile into Yellowstone Park. 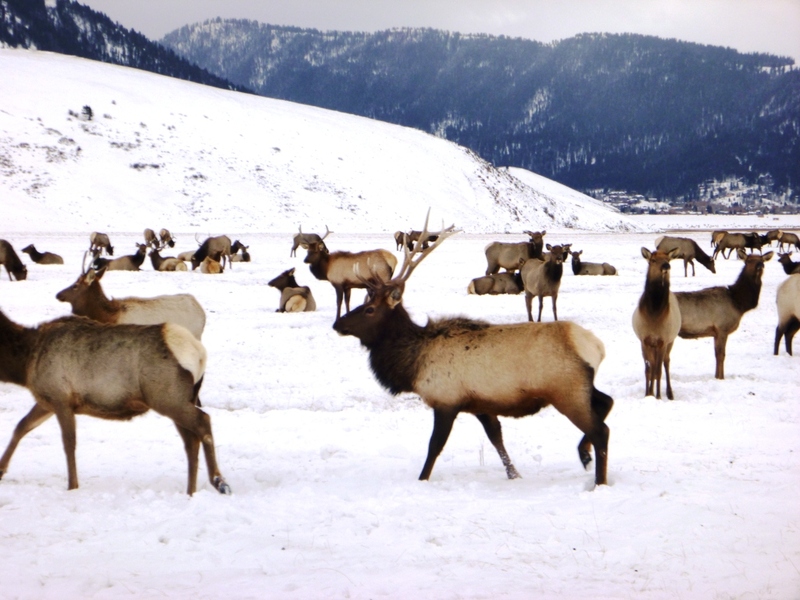 Yellowstone in the winter is an amazing experience since the animals migrate down into the valleys and you can see bison, elk and other kinds of animals up close and personal. 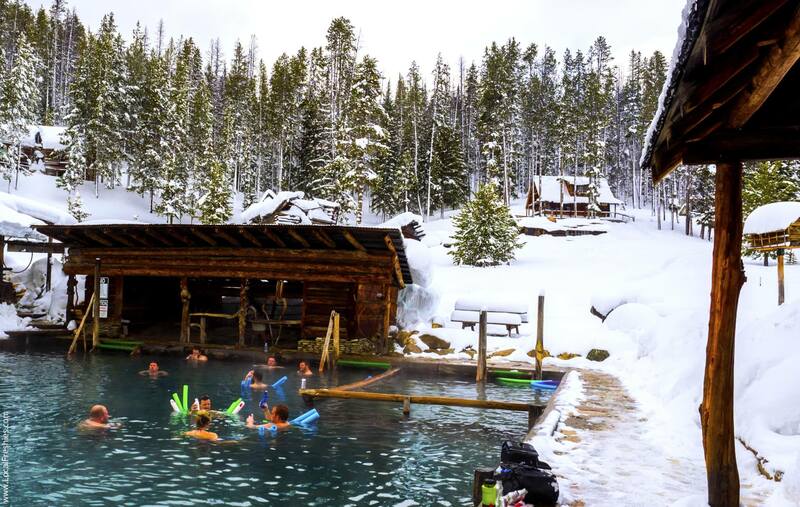 In addition, near Big Sky Resort, Lone Mountain Ranch offers a unique experience of a sleigh ride at night to a cabin in the woods where you get serenaded by an old cowboy as you eat dinner over candlelight. For more information, check it out here. Besides activities, a person should also consider a location for its scenery and past. An example of this is Telluride or as it was originally known “TO HELL YOU RIDE!”. 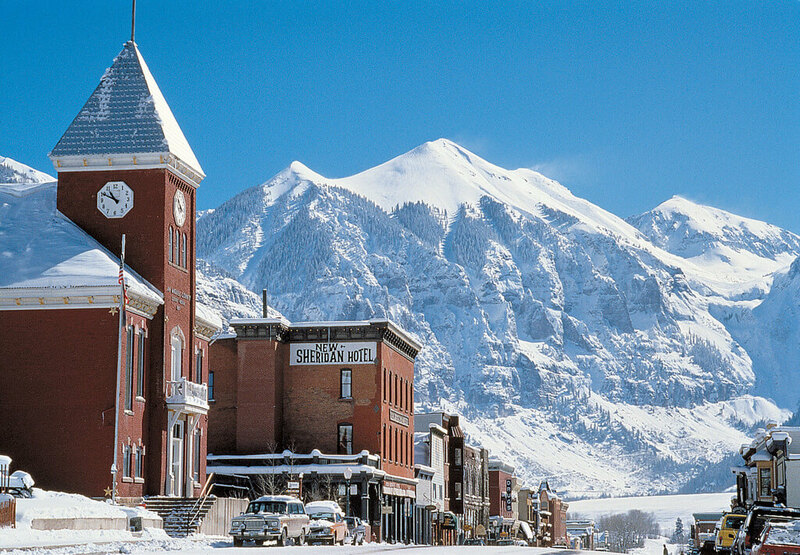 A historical town best known as the home of Butch Cassidy and the Sundance Kid, it’s located in Southwest Colorado. The town is surrounded by the largest concentration of 14,000 foot peaks in Colorado. This means that the view will take your breath away as you walk through the center of town exploring the shops and enjoying all the great restaurants that are available in town. There is a reason why a lot of celebrities have homes in this town. So, what can Lake Tahoe provide for a couple? Do you want to unplug from the technical world and just enjoy each other’s company? Sorensen’s, just down the road from Kirkwood, is an affordable place where you can rent a small cabin and enjoy each other’s company without having WiFi, television or any other distraction this world throws at you. In addition, the Kirkwood Inn, just outside the ski resort, is a great place to have a few drinks and a romantic dinner with your better half. This resort might be in the middle of nowhere, but it caters really well to kids on the mountain. An entire part of the mountain is dedicated to kids and introduces them to the proper techniques of skiing/riding powder, trees and lift loading in a safe and fun environment. In addition, Grand Targhee is EXTREMELY affordable compared to the larger mega-resorts. One thing to note… there isn’t a ton to do outside of the resort so be sure that your family can preoccupy themselves with snowball fights and building snowmen. For a family, it’s always good to have an affordable resort and Colorado resorts are some of the most affordable resorts in the country. And in the Front Range, Keystone is definitely the king in Kid-friendly resorts. They have a specific area just for kids to introduce them to the park as well. WOO HOO! Look at all that fresh snow! 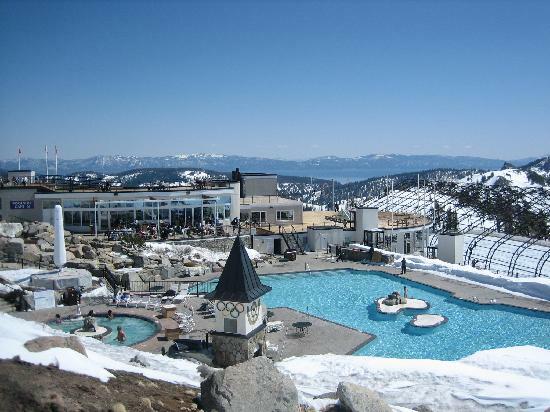 We all know the mega-resorts around Lake Tahoe but Sierra-at-Tahoe is great for families. They have upgraded the lodge so that if one parent wanted to hang out and catch up on email while the other is out with the kids, they could. In addition, they understand that skiing/boarding with a family is expensive so value is just as important as an experience. To help reduce the cost for parents, they have a special lift ticket that a mom and dad can share together. Finally, Sierra-at-Tahoe caters towards kids by having a Star Wars theme along with designing terrain such as mini-rollers, bumps and jumps to keep them entertained but safe while introducing them to unique terrain. No matter if you are a parent, a bachelor/bachelorette or a couple looking for a romantic trip, hopefully this article helps with picking the right place! Be sure to also check out our article which goes into the “other” things you should consider when planning a trip. Here is a link to that post.